Whatever else goes wrong for New Zealand this year, it is a safe bet that it cannot rival the fate that overtook the All Blacks on September 3 1949. That date saw them suffer a unique misfortune - and one unlikely ever to be emulated - when they lost two international matches on the same day. This double failure was rooted in the New Zealand Rugby Union's guilt at having betrayed their players by bowing to South African apartheid laws, sending a touring team there minus several Maoris. The consolation prize was a home series against Australia, with the Bledisloe Cup at stake. The team that took the field against the Wallabies at Athletic Park, Wellington was therefore some way from the 'Third XV' it has sometimes been labelled. Captain J.B.Smith was, in the opinion of 1920s star Mark Nicholls, the best ever centre in terms of serving his wings, and admired equally by his great Welsh contemporary Bleddyn Williams. Half-backs Vince Bevan and Ben Couch might well have made the Test team in South Africa. Wing Jack Kelly, a victim of selection rather than racism, was reckoned the second best fullback in the world when he toured Britain four years later. His misfortune was that the best, Bob Scott, was a team-mate. Where they perhaps fell down was among the pack. 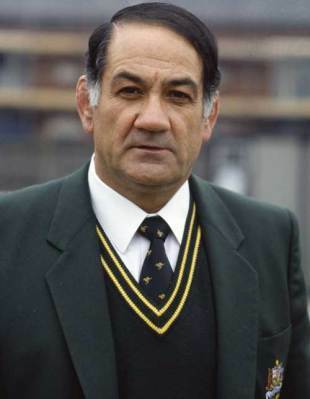 Flanker Bob Stuart would prove himself an outstanding All Black captain in Britain while giant lock Richard 'Tiny' White was beginning an international career that would rank him among the All Black immortals. But four of the eight played their only Test rugby in this series. They were also picked at short notice, with the team announced only 24 hours beforehand, and denied the services of a coach - standard practice in the northern hemisphere until the 1960s, but certainly not in New Zealand, where players were accustomed to coaching. They also confronted one of the better Australian teams. Captain Trevor Allen was a world-class centre and the back five were memorable both as individuals and a group. Lock Nick Shehadie was a working class boy of Lebanese origins who had broken all sorts of social barriers simply by becoming a Wallaby, and would shatter many more on his way to becoming Lord Mayor of Sydney. Debutant partner Rex Mossop was destined for a distinguished league career followed by another as a cheerfully noisy broadcaster. On the flanks Colin Windon was a tough, pacy operator who had had an eventful tour of Britain in 1947-8, getting himself sent off at Llanelli, but scoring two tries in the victory over England at Twickenham, and Keith Cross would play for Australia until 1957. New No.8 Brockhoff was destined to coach, as well as play for, the Wallabies. Any All Blacks aggrieved at not being in South Africa were treated to a taste of what it was like there as Brockhoff launched himself at their half-backs in the same manner as Springbok Hennie Muller. Australia were completely dominant in the first-half. Windon, described by Shehadie as 'a try-scoring machine, a superb attacker with the speed of a threequarter…simply peerless in support play', took a pass from Mossop to score, and debutant New South Wales wing Ralph Garner went over twice more before the break, when Australia led 11-0. Kelly, destined to become headmaster of Takapuna Grammar School near Auckland, claimed the only points of his Test career from a penalty soon after half-time, but there was never any real likelihood of the All Blacks coming back. A late try by Otago wing Graham Moore was no more than consolation and Australia won 11-6. A few hours later the other All Black team went down 9-3 to South Africa in Durban, conceding a decisive 3-0 lead in the series to the boot of Okey Geffin, whose three penalties outweighed a single New Zealand try. The New Zealand Freelance newspaper headlined an 'All Black Day in rugby'. New Zealand lost the second Wallaby Test as well, going down 16-9 at Auckland where Mossop, asked to send a message back to Australia, gave a foretaste of his broadcasting career by telling his compatriots: "We've beaten the bastards! You beauty!" Windon was again among the scorers, building towards a career total of 11 tries in 20 tests that would make him Australia's all-team leader until he was overtaken by Brendan Moon in the 1980s. There was also an odd postscript in 1981, as New Zealand, finally waking up to what it had tolerated for too long, was torn apart by the disorder accompanying that year's Springbok tour. Holding the key role of Police Minister in the administration led by hardline right-winger Ron Muldoon was Ben Couch, one of the men who played against Australia in 1949 because his colour had denied him the chance to go to South Africa.